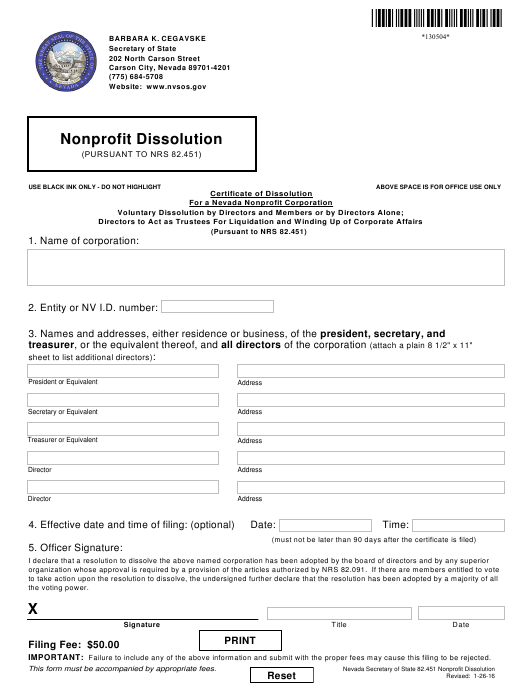 Form 130504 is a Nevada Secretary of State form also known as the "Certificate Of Dissolution For A Nevada Nonprofit Corporation - Voluntary Dissolution By Directors And Members Or By Directors Alone". The latest edition of the form was released in January 26, 2016 and is available for digital filing. Download a PDF version of the Form 130504 down below or find it on Nevada Secretary of State Forms website. (attach a plain 8 1/2" x 11"
Failure to include any of the above information and submit with the proper fees may cause this filing to be rejected. This form must be accompanied by appropriate fees.